Anthony Milano (2008-): Anthony is interested in investigating questions related to spin and interior properties of Mercury. 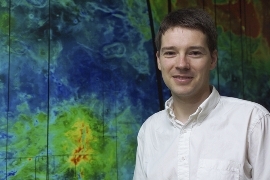 Patrick Taylor (2004-): Patrick worked on dynamical and physical characterization of asteroid (54509) YORP, formerly known as 2000 PH5, providing the first direct observational evidence that an increase in the spin rate of the asteroid is due to the YORP effect. Patrick is now studying tidal interactions in close binary systems. Adam Waszczak (Summer 2008 REU student): Adam will work on planetary gravity fields and MESSENGER radio science data. Emily Kramer (Summer 2007 REU student from MIT): Emily is analyzing mutual events in the Kalliope/Linus binary system. Piyanat Kittiwisit (Spring 2007-current): Piyanat is analyzing high resolution topographic maps of the lunar polar regions. Seth Jacobson (Spring 2007-current): Seth is analyzing Hubble Space Telescope images of binary trans-Neptunian objects. Greg Vesper (Summer 2005-Spring 2007): Greg has analyzed Keck adaptive optics images of main belt asteroids in an effort to constrain the abundance of binary asteroids in that population.